Официальный сайт - Михаила Чекалина - Mikhail Chekalin - 3. 1993 - "Film music 1"
3. 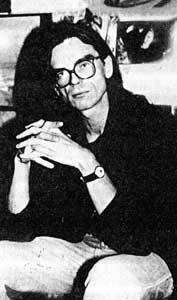 1993 - "Film music 1"
Independent Russian Composer M. Ch. The Electronic - Acoustic - Eclectic - Music. Author's phonogram. Recorded in March - April 1991. All music composed, performed and mixed by M. Chekalin. 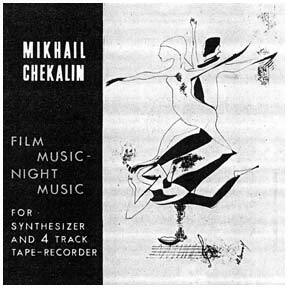 Producer M. Chekalin. Editor N. Katsman. Cover design by S. Kolobkov. Drawing on the front cover by M. Chekalin. Photo by D. Chekalin. Запись сочинения - 1991 г., март - апрель. Все композиции и исполнение, а также микширование - М. Чекалин. Продюсер М. Чекалин. Редактор. Н. Кацман. Оформление конверта С. Колобкова. Рисунок на лицевой стороне М. Чекалина. Фото Д. Чекалина. Настоящий альбом записан с использованием только одного синтезатора Roland D-50 и кассетного 4-канального магнитофона Fostex portasound без каких-либо иных средств, таких, как секвенсоры и т. п. Затем полученная 4-канальная запись была сведена на цифровой (DAT) магнитофон. Одна из принципиальных концепций этого альбома — технологический минимализм при весьма неограниченных эстетических задачах в художественном выборе. Как бы противоположно столь распространенной на Западе эстетике направления минимализма на фоне безграничного выбора технологических возможностей и дорогостоящей экипировке инструментария электронных студий. Некий оптимистический жест и вызов художника подавляющему известному снобизму индустриальных студийных несравнимо дорогостоящих для жизни советски-российского художника проектов. Это, возможно, самый неконформистский проект а электронной музыке подобного класса и при этом поэтически ориентированный и весьма насыщенный красками, далекий от пуританства а звуке альбом. Only one synthesizer Roland D-50 and Fostex 4-track tape-recorder are used for recording of the present album. Then this 4-track recording was mixed on digital (DAT) tape-recorder. Technological minimalism attached to unlimited aesthetic aims in artistic choice and contrasted to western aesthetic minimalism attached to unlimited choice of technological possibilities and studio electronic equipment - is one of the principal concepts of the album. It's a certain optimistic gesture and challenge of the musician to the oppressing snobbery of industrial studio projects which are very expensive for a Soviet-Russian artist's life. It's perhaps, the most non-conformistic project in electronic music of such a level, being at the same time poetically oriented and quite a picturesque album far from puritanism in sound expression. This album represents a free form of independent compositions, movements and pieces. (The total time of sounding is 1 hour 40 minutes, CD version is limited to 1 hour 16 minutes). It took me a few nights to record this album in spring 1991 in my kitchen where I have found myself again, after about 10 years of studio researches. The most minimal set of technological means usually applied for such kind of music was used for this album recording. This album is "domestic" and "night", it's a new experiment, a new for me landmark in my conception of composing and performing. Now I can apply all my experience in unofficial, home situation with minimal means, but 10 years ago this situation could only have been dreamed of. In whole, composing in various conditions was the basis of my conception as of a studio composer. Having fought down all my snobberly I dare to start everything anew. This album is the most independent of all those I recorded following my independent conception. As well as in all my previous compositions (consult the discography) I don't use other methods except manual author's performance. By the term "album" I already mean the form, time limits in which my music is placed taking into consideration attachment to a sound bearer (cassette, record, CD). It may be a very free form of very different compositions self-independent enough but coexisting in unity interpenetrating. Generally speaking, this "beyond concert" music of such studio origin doesn't display any tendency to external seriousness, self-affirmation and symphonic pathos. So if the music is symphonic, it is at the same time very "inner", if you like "existential". Now some words about the title. "Film-Music" is the most self-independent composition, it wasn't written for any definite film. Last summer I received a letter from famous Karl-Heinz Stockhausen, in which he expressed his opinion on my work (these were movements from my "Russian Mystery"). He thought that I was a success with "film-music" in those my compositions, where I prefered, for example, Ostinato or excessive expressiveness and I wouldn't be able to avoid that. First in this statement I perceived some sarcasm: that it is cinema-music in the sense of democratic language from the avant-gardist point of view of classically refined and "elite" Stockhausen. On the other hand, perhaps, he means literally phonogram, as I always sign all my cassettes as "author's phonogram", because my music has been existing only as recording tape, and in German it literally means "film-music". Never the less, I would be glad, if he means the democracy of my musical language in non-complimentary for me, but a little estranged from isolated walls of classical vanguard sense. For me the "golden section" in musical art is determined in the mission of electronic synthesizer music of the 80s' new generation, that of the "New Age" epoch. Thus this title was born. As a matter of fact, I can name so any album independently on the composition conception, genre, sounding, because each album is a self-independent work existing only as a concrete recording, namely a musical videofilm. By the way, this music can be applied for any video, performance or ballet and if someone wants to do it, I wouldn't object. So, "Film-Music" is still studio, as in the previous years, but first "domestic" experiment, which I dedicate to myself.